We all enjoy take these to the movies or for long car rides. If I am giving my kids a lolly, I don’t mind giving them Chup Chups Lollipops as they enjoy it for longer than other kinds of lollies. The Best of packets have great flavours and there is usually a flavour that we all like. I would love if they introduced packets that had one particular flavour that we could choose, as in my family we all like the grape flavour or cola. 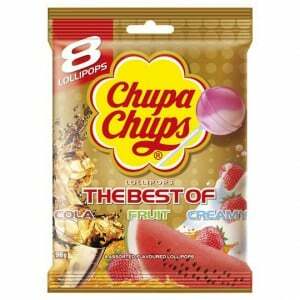 Chupa Chup lollipops are delicious tasting lollipops and they last and have a top quality flavour. We have so many favourite flavours and a selection is quite a welcome treat. Chupa chup lollipops are a great small treat for kids, my kids enjoy the different variety of flavors, my kids like picking out the one they want when they get to choose one. Chupa chups are a great lolly we have loved when we are kids.The best of includes all the delicious flavours we love,a very much good buy! Chupa Chups have been around for as long as I can remember and it was always fun trying out the new flavours. The Best Of Chupa Chup lolly bags means everyone gets their favourite flavour. I absolutely love chupa chups. These are such a wonderful childhood memory and what an epic way to have them… All of the best flavours! How would you rate Chupa Chups Lollipops Best Of?